Mon., March 21, 2016, 10:53 p.m.
SAN DIEGO – Winston Shepard had 20 points and 10 rebounds, and Trey Kell added 16 points to lead San Diego State to a 93-78 victory against Washington on Monday night for a spot in the men’s NIT quarterfinals. The Aztecs (27-9) will host Georgia Tech on Wednesday night, with a trip to Madison Square Garden at stake. Georgia Tech beat South Carolina 83-66. The Aztecs are in the NIT for the first time since 2009, when they reached the semifinals before losing to Baylor. SDSU was denied a seventh straight NCAA tournament berth after losing in the Mountain West Conference tournament championship game to Fresno State. Shepard, coming off the first triple-double in school history, and Kell both had big shots after the Huskies went on a 15-2 run to pull to 69-64 on a 3-ponter by Marquese Chriss with 7:35 to play. Shepard had two layups while Kell made four free throws and hit a 3-pointer that pushed the lead back to double digits. Dejounte Murray scored 20 for UW (19-15). Chriss, who drew his fourth foul early in the second half, scored 19 before fouling out with 1:13 to go and SDSU leading 89-76. Malik Dime, Matisse Thybulle and Dominic Green also had four fouls apiece. Andrew Andrews scored 17. 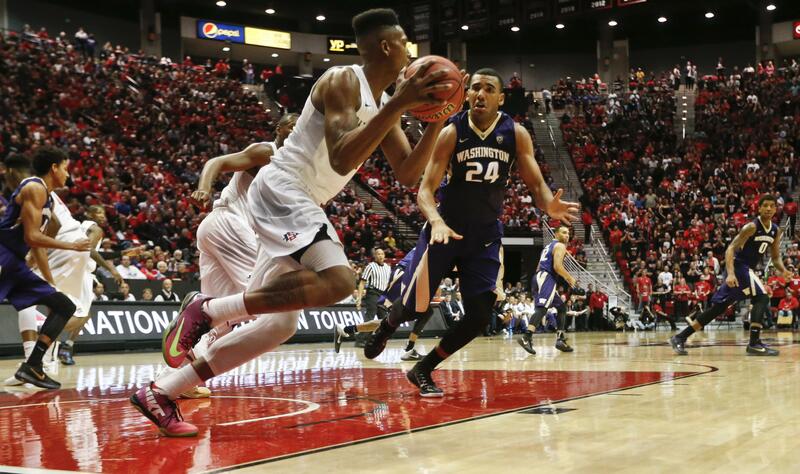 Jeremy Hemsley scored 13, Matt Shrigley 12 – all on 3-pointers – and Malik Pope and Dakarai Allen each had 10 for SDSU. Pope also had 12 rebounds. Shepard struggled early, including putting up a few air balls. But he started finding his shot during an 18-5 stretch that gave SDSU a 45-29 halftime lead. Shepard made a turnaround jumper and had a putback during the closing stretch. Pope scored six points in the final minutes of the first half, including a 3-pointer, and Shrigley made his third 3 just before the buzzer. SDSU atoned for a 49-36 loss at Washington last season, its lowest-scoring game since moving up to Division I in 1970-71. UW announced just before tipoff that freshman forward Noah Dickerson, its fourth-leading scorer, was suspended for violating team rules and didn’t make the trip. Published: March 21, 2016, 10:53 p.m.